The year 1995 was memorable for many reasons — including the frequency with which terrorism intruded. In March 1995, members of a Japanese cult attacked the Tokyo subway system with Sarin gas, killing twelve people and sickening more than 5,000 others. In April, the elusive Unabomber struck for what would be the final time in his intermittent, 17-year letter-bombing spree. In September, the Washington Post and New York Times agreed jointly to publish the Unabomber’s so-called Manifesto, a diatribe against industrial society that provided clues leading to his capture the following year. In early October 1995, the blind sheik, Omar Abdel Rahman, and nine other militant Muslims were convicted in federal court in New York City of plotting terror and assassinations across the city. Abdel Rahman was sentenced to life in prison. Meanwhile, a secret U.S. National Intelligence Estimate written in 1995 warned, presciently, that Islamist terrorism posed a cold-blooded threat to the country. The deadliest and the most brazen act of terrorism in America in 1995 took place in Oklahoma City 20 years ago next week. There, in front of the Alfred P. Murrah federal building, a disgruntled U.S. Army veteran named Timothy McVeigh set off a massive truck bomb made of ammonium nitrate and nitromethane racing fuel. The attack occurred just after 9 a.m. on April 19, as the Murrah building was filling with federal workers and visitors pursuing routine business with the government. Without warning, the truck bomb went off in a roar heard or felt for miles. The concussion from the blast swept the streets nearby, destroying or damaging buildings and cars, and sending debris and shards of plate glass flying everywhere. The Murrah building was devastated, its North face blasted and nearly gone. It looked as if some gigantic, diabolic force had reached down and scooped away much of the facade. 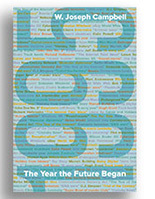 As I write in my latest book, 1995: The Year the Future Began, the bombing’s toll “was staggering and unprecedented for an act of domestic terror in the United States. 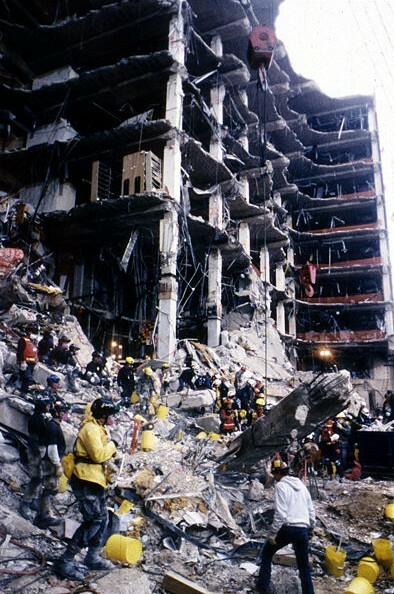 Inside the stricken building, 163 people were killed, including federal agents, Secret Service personnel, and armed forces recruiters. Five other people were killed nearby. … The fatal victims ranged in age from three months to seventy-three years. “They included nineteen children—fifteen of whom were at the America’s Kids day-care center on the Murrah Building’s second floor, the windows of which allowed a view of Northwest Fifth Street and the sidewalk cut-out” where McVeigh — who was executed for his crimes in 2001 — had parked the truck. Oklahoma City has hardly languished in the intervening 20 years. It is today a vibrant yet modest place, a friendly town for which a visitor can quickly develop an affinity. The site of the bombing has been impressively transformed into an outdoor memorial — a soothing, well-manicured park that offers no immediate reminder of the cold-blooded McVeigh, nothing obvious that tells visitors where he parked the truck and walked away. The centerpiece of the memorial is the Field of Empty Chairs: Where the Murrah Building once stood, 168 glass, bronze, and stone chairs are arrayed in rows that roughly correspond to the floors of the stricken building. The effects of the bombing radiated far beyond Oklahoma City. In important ways, they reverberate still. The attack, I point out in 1995, “represented a turning point in domestic security and security precautions for Americans.” It helped “to mold and put in place a hypercautious, security-first mindset that encouraged the imposition of restrictions intended to thwart the prospect of terrorist attack, a prospect that often seemed vague, amorphous, or abstract. “These restrictions became tighter and more obsessive over the years,” especially after the terrorist attacks of September 11, 2001. Striking evidence of this emergent mindset came a month after the attacks, in Washington, D.C.
Before dawn on May 20, 1995, authorities began setting up concrete barriers to detour vehicular traffic from a two-block section of Pennsylvania Avenue nearest the White House. The closure of two blocks of Pennsylvania Avenue signaled not only an embryonic security-first mindset; it marked the emergence of the capital as a bunker. 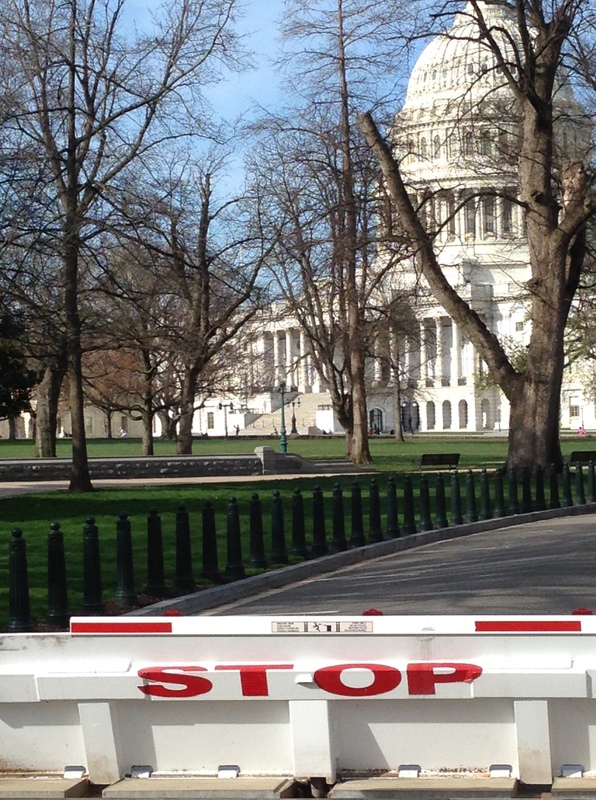 Sections of several streets near the Capitol were closed to vehicular traffic in the summer of 1995. Concrete planters and Jersey barriers went up near other government buildings that were presumed to be potential targets of terrorists. This entry was posted on April 13, 2015 by W. Joseph Campbell in 1990s, Anniversaries, Oklahoma City bombing, Terrorism, Watershed year and tagged 1995, flashbulb moment, Oklahoma City bombing, security-first mindset, Terrorism, Truck bomb, Watershed year.